【ギリシャ・ローマ神話】 アポロン，アポロ 《太陽神; 詩歌・音楽・予言などをつかさどる; cf. Helios，→Sol 1》. From Latin Apollo, from Ancient Greek Ἀπόλλων (Apóllōn). (Greek mythology, Roman mythology): The son of Zeus and Leto, (または Jupiter かつ Latona), and the twin brother of Artemis, (または Diana). He was the god of light, music, medicine, and poetry; and prophecy, dance, manly beauty, and more. (astronomy) The planet Mercury, when observed as a Morning Star. (astronomy) Short for 1862 Apollo, an Apollo asteroid. (NASA, space science) A United States space program, and the vehicles it created, used for human travel to the moon. (with "the") Apollo Theater, a music hall in New York City associated with African-American performers. The butterfly Parnassius apollo, a large swallowtail with black and red spots on white wings. From the object 1862 Apollo. (astronomy) An asteroid possessing an orbit that crosses the orbit of the Earth and an orbital period of over one year, with semimajor axes greater than 1 AU, and perihelion distances less than 1.017 AU. From Ancient Greek Ἀπόλλων (Apóllōn). Apollo (Attic, Ionic, and Homeric Greek: Ἀπόλλων, Apollōn (gen.: Ἀπόλλωνος); Doric: Ἀπέλλων, Apellōn; Arcadocypriot: Ἀπείλων, Apeilōn; Aeolic: Ἄπλουν, Aploun; Latin: Apollō) is one of the most important and diverse of the Olympian deities in Greek and Roman mythology. The ideal of the kouros (a beardless, athletic youth), Apollo has been variously recognized as a god of light and the sun, truth and prophecy, medicine, healing, plague, music, poetry, arts and more. Apollo is the son of Zeus and Leto, and has a twin sister, the chaste huntress Artemis. 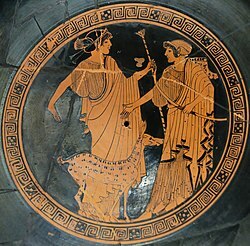 Apollo is known in Greek-influenced Etruscan mythology as Apulu. Apollo was worshiped in both ancient Greek and Roman religion, and in the modern Greco–Roman Neopaganism.